To join the commemoration and celebration of the Women's Suffrage movement, particularly the centenary of the Great Suffrage Pilgrimage of 1913, we are publishing a series of articles on the women's suffrage movement in Cornwall. Starting with this retrospective, based on The Cornishman newspaper's archives, we will then be hosting guest posts from historians about the impact of this movement on Cornish politics and culture. By 1913 there was a clear difference between the tactics of the Suffragettes, led by Pankhurst (Women’s Social and Political Union) who favoured direct action to force the issue of votes for women, and the Suffragists (National Union of Women’s Suffrage Societies) who championed the continuation of non-violent protests and petitions which had started in the 1870s. This is a slightly extended version of an article I wrote for The Cornishman which came out today [Errata: The Cornishman mis-edited my original article suggesting that the Suffrage Pilgrimage as being organised by the Suffragettes. Correction sought. Ed.] It also highlights the work of other projects, notably Dreadnought South West's play, Oxygen and the forthcoming social history exhibition at Penlee House, which are marking this momentous event which changed the lives of tens of thousands of women. The first thing to note is that although the Suffragettes have remained in popular consciousness as the face of Votes for Women, there were in fact two movements campaigning for broadening the franchise (i.e. reforming the law so all women could have the vote) and other issues of social justice such as child poverty, poor working conditions and bonded white labour (slavery). The Great Suffrage Pilgrimage was initiated by the Suffragists who prided themselves on their peaceful tactics: rallies, marches and petitions. Millicent Fawcett was the face of the Suffragists and their colours were red, green and white. The Suffragettes who came to be known through names such as Emmeline Pankhurst and Emily Davison (who died tragically at on Derby Day 1913) took direct action. Their cause was to use drastic measures to draw attention to the appalling injustice that allowed the law to be based on the decisions of men only. Their colours were purple, green and white. Postcard showing Lands End to London Great Suffrage Pilgrimage march. Reproduced with permission from Jill Morison. 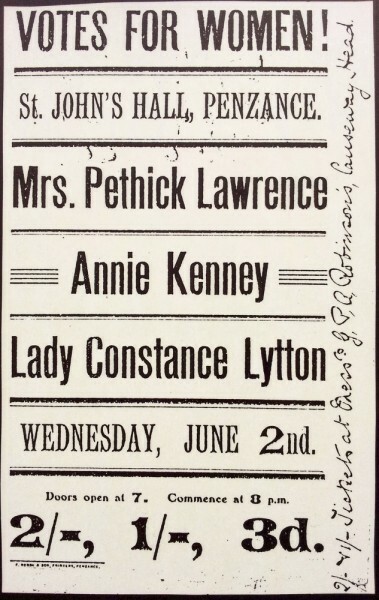 In the 19 June 1913 edition of The Cornishman, sandwiched between a report on the output of black tin from Botallack Stamps and a physician’s advice about curing indigestion, was a short notice headlined MRS. PANKHURST RELEASED. Emmeline Pankhurst was a Suffragette leader and had been on hunger strike, enduring the torture of force-feeding, while incarcerated at Holloway Prison for conspiracy to commit property damage. Emily Davison had also tragically lost her life while trying to pin Suffragette colours to the King’s horse at the Epson Derby barely a week before. By 1913 there was a clear difference between the tactics of the Suffragettes, led by Pankhurst (Women’s Social and Political Union) who favoured direct action to force the issue of votes for women, and the Suffragists (National Union of Women’s Suffrage Societies) who championed the continuation of non-violent protests and petitions which had started in the 1870s. Cornish activists enjoyed widespread support, from the dominant Liberal political class and influential religious groups such as Quakers headed by families such as the Foxes of Falmouth. “There is a rumour that at Camborne they may be pelted with stale eggs"
Newspaper extract from The Cornishman, 21 June 1913. NUWSS van on Market Jew Street en route through Penzance, 19 June 1913 taken by E. Thomas. Image courtesy of Penlee House Gallery & Museum, Penzance. A rally led by Fraser took place on a makeshift stage in the Pig Market where a large crowd gathered, including the “hobble-de-hoy.” Fraser’s eloquence was complemented by the reporter, “few orators of the masculine gender could have held and swayed an audience in the open air as did Miss Fraser.” A scuffle broke out after her rousing speech as she had apparently been kicked in the ankle. The leaders had to be escorted by police to a safe-house on Clarence Street. 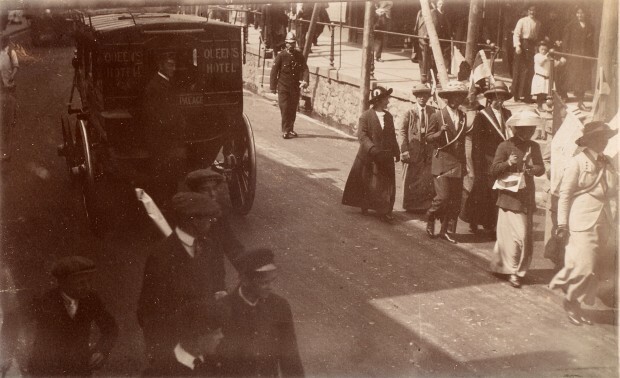 Suffragist marchers in Penzance, 19 June 1913 taken by E. Thomas. Image courtesy of Penlee House Gallery & Museum, Penzance. It took a further ten years for universal franchise to be granted to all women in 1928. A small number of women were finally given the vote after World War 1 in 1918 as part of the Representation of the People Act. About 8.4 million enfranchised women (related to status and property holding) over the age of 30 voted. It took a further ten years for universal franchise to be granted to all women over the age of 21 in 1928. That was a full 15 years after the Great Suffrage Pilgrimage and the height of Suffragette action. Katherine Bradley, Friends and Visitors: a History of the Women’s Suffrage Movement in Cornwall 1870-1914 (2000, The Hypatia Trust). Available from the Hypatia Trust Online Bookstore. £5.